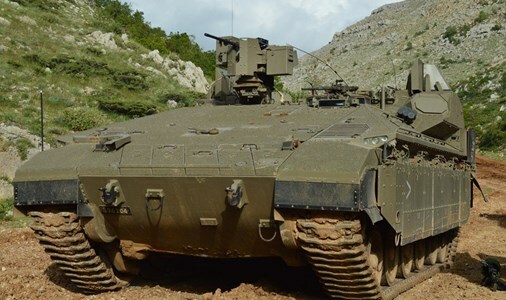 The Israel Defense Forces (IDF) has released new details of its next-generation armored vehicle Namer (Tiger), saying it is considered one of the safest vehicles in the world. The Namer armored vehicle is capable of overcoming almost any obstacle in the field, and thanks to its high-quality armor, is considered one of the safest vehicles in the world. Additionally, it’s able to move on a wide variety of terrain and can target objects from a great distance. This powerful vehicle transports soldiers during operations in enemy territory and expands the capabilities of the IDF Ground Forces. Terrorist organizations in the Middle East challenge Israel’s existence on a constant basis with bombs, rockets, and underground warfare. The IDF is using the latest technology to combat those who seek to harm Israeli civilians or sovereignty. One of the crucial aspects of creating this technology is ensuring that it is both safe and powerful. In order to combat enemy forces, combat engineering soldiers use unique Armored Personnel Carriers (APCs). Previously, IDF soldiers used the Puma, a combat engineering vehicle and APC. However, in 2016, the IDF got the advanced Namer armored vehicle, which significantly expanded the army’s operational capabilities. The 603rd Battalion has been training with the machine and works on fully comprehending everything it’s capable of doing. Lieutenant Koren, the Company’s Deputy Commander in the Battalion said, «We know how important what we’re doing is and so we make sure we train constantly. We prepare for the second we receive an order and need to carry it out in the best possible way». The Namer armored vehicle protects soldiers, while transporting them through complex and dangerous places. «We know where the enemy will hide their weapons and even place rocket launchers. Additionally, our soldiers are experts in underground warfare and we have the means to defeat Israel’s enemies and destroy the terror tunnels», Lieutenant Koren emphasized. According to Armored Vehicles, the hull is based from the Merkava Mk. IV; thus, making this vehicle heavily armoured due to the amount of protection this 60 tonne vehicle carries. The weapons on this vehicle utilizes the Samson Remote Controlled Weapon Station (RCWS). This type of weapons station can house the M2 Browning machine gun (50 cal./12.7-mm) and also the Mk. 19 belt fed grenade launcher. However, the vehicle can also carry on top weapons which utilize the 7.62-mm machine gun and other variants of this vehicle include a 60-mm mortar system. The Namer is also armed with 12 smoke grenade launchers. The Namer is powered by a 1200 hp/895 kW turbo-charged engine, the same engine seen on earlier models of the Merkava, namely the Merkava III which has a power to weight ratio of 20 hp/tonne. The vehicle itself is able to carry an additional 9 fully equipped infantry along with the 3 crewman, gunner, driver and RCWS operator. The Namer has a V shaped hull to withstand blasts from Improvised Explosive Devices (IEDs) and can also survive in nuclear conditions as it has an NBC protection system installed to combat Chemical, Biological, Radiological, and Nuclear (CBRN) conditions.